I used to be an angry child. At some point I picked up Guru Swami Sivananda’s book on Anger and that was my start to managing and understanding my anger. I’m not angry anymore, even at Delhi drivers. I do still get angry but it doesn’t last and it doesn’t consume me the way it did, nor do I carry it with me, for days or weeks or overnight. The other day I went into a rage about something quite small and it brought a sense of unease, because I’m more self-aware and I thought I’d left that behind me – apparently not! The sequence went like this- I responded to something said to me with buckets and buckets of anger, I boiled and responded with anger and after the fact I felt hurt and upset about what had been said to me. I’m smarter now, so I have some fabulous books that help me to have an outside or different view on a situation when all I can do is see it the same way. So I picked up this book by Rohini Singh where she talks about emotions that hold us hostage. She talks about our pet-emotions, our “Achilles heel” of emotion as it were- worry , anger etc. I found myself looking to read her observations on my age-old nemesis Anger and opened up to Hurt and Resentment instead. She likens hurting someone or feeling hurt to the throwing of a stone – pelting someone with a stone basically- and she looks at it from both points of view. Rohini says when people throw a stone at you ,they’re not at their best and when you’re Affected by someone’s well-aimed throw you’re not at your peak either. That is things have power to hurt us if we let them! And when people throw a metaphorical stone at us , it’s an attempt to grab at our energy or to have our attention in a very twisted way. When I go back and re-trace what was said and why this fight occurred; this makes complete sense to me. If I was upbeat and positive and my “energy system” both physical and mental was at it’s peak, I would not have allowed myself to be so affected. It would have been like water off a ducks back. Not this duck apparently. The things said were clearly an attempt to get attention and to “grab my energy” and I allowed it to happen. Sigh. Old Habits do die hard. I’m not the only person who goes nuts when angry. 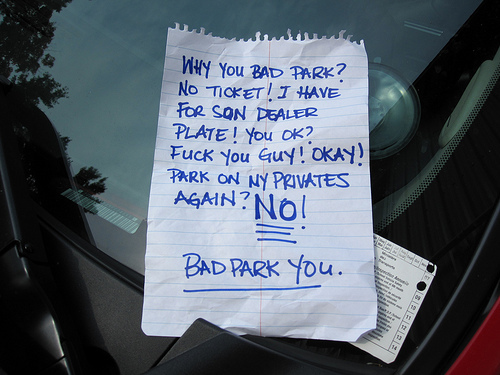 Check out what this lady wrote to someone who’d parked on her property. Bad Park You indeed. Tags: Anger Management. Bookmark the permalink. Previous post ← Encore Barack!